Storemasta polyethylene safety cabinets, from Storemasta , are built to last from 100% high density polyethylene. With a smart modern profile, the Storemasta polyethylene safety cabinets are an ideal inclusion in any laboratory. The Storemasta polyethylene safety cabinets are completely metal free for long term storage of corrosive substances. The Storemasta polyethylene safety cabinets are fabricated and fully welded from 15mm high density polyethylene. The Storemasta polyethylene safety cabinets have self closing doors with flush mounted lockable handles which can be opened from the inside. The doors have integral pivot pins so there are no hinges to corrode. The adjustable shelves are profiled for rapid spill dispersement to the sump and the top is also neatly profiled for decanting where required. Storage can be utilised above the sump or in the sump whilst the dual compartment cabinets allow acids and bases to be conveniently stored in one cabinet. Chemical resistance has been tested by the CSIRO. 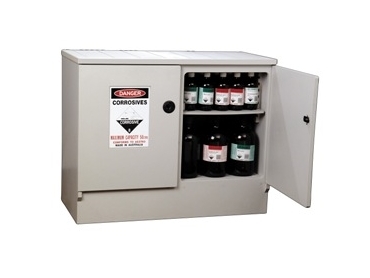 Storemasta offer the Storemasta polyethylene safety cabinets for corrosive substances in capacities from 50L to 160L.